Something in your life seems never needed but when you need it one day you could not find it at once. 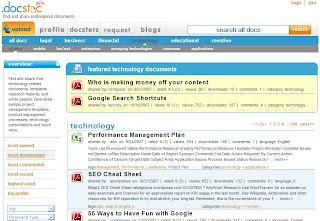 Docstoc is an online community which offers a flatform for people post, share, search, upload and download professional documents. You can check different documents by sort, such as Legal, Business, Technology, Educational, and Creative. If you have professional documents you can upload them, Docstoc is supporting doc, .pdf, .xls, .ppt, .ppt, .txt now. you can also store your files on its server. If you could not find document that you needed, you can request it in the future, just click on the request tab, and add the title, tags, categories, language, and file type of any document that you are looking for. When someone upload that kind of file, Docstoc will send email to remind you. It is useful for someone who need professional document such as Web Development Agreement for you want hire a web designer for your website. I found some contracts are very useful.